Home > Firearm Accessories > The Bulldog - Versa-Holster Semi-Automatic Pistol Series Compact 3"-3.5"
The Bulldog is an ambidextrous and convertible shoulder/hip holster system and uses our NEW Speed-Retainer to secure the pistol. 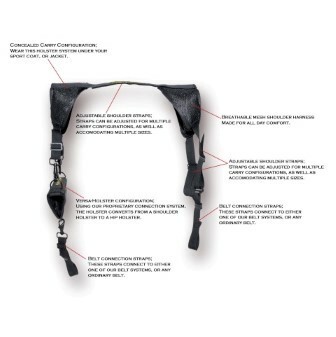 Features adjustable shoulder straps and belt connection straps making it easy to configure for multiple carry configurations. Fits most semi-auto pistols.